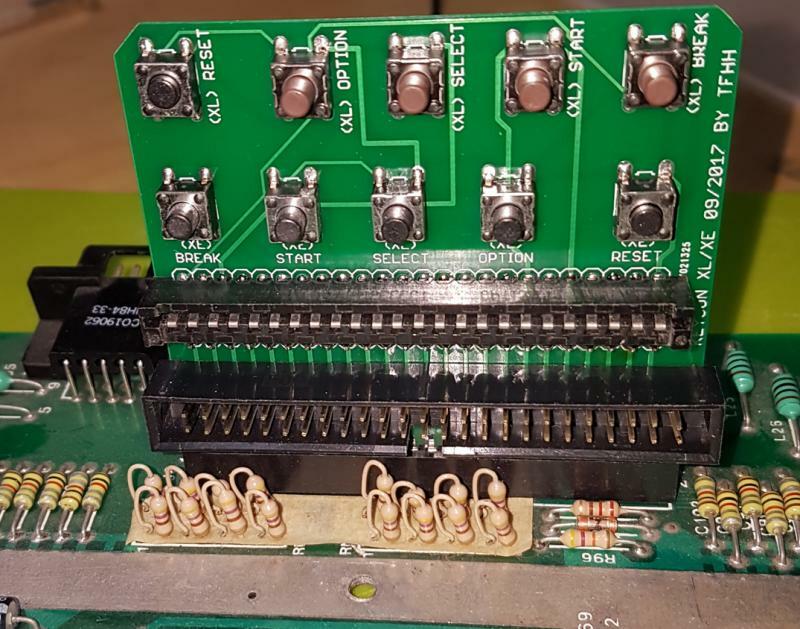 For diagnostic issues (for example using the Super SALT cartridgdes) the most needed keys are seperate located on the KEYCON PCB. So you can use endless loop tests and quick diagnostics with SALT without connecting a keyboard. This saves the mylar cables from breaking and so on. For each system (XL or XE) you will found the keys RESET, OPTION, SELECT, START and BREAK. For already defective mylar keyboard cables, the main problem is always... how to connect ANY type of substitute to the genuine keyboard connector? Without using direct soldering or many glue it´s not a working solution for a long time. 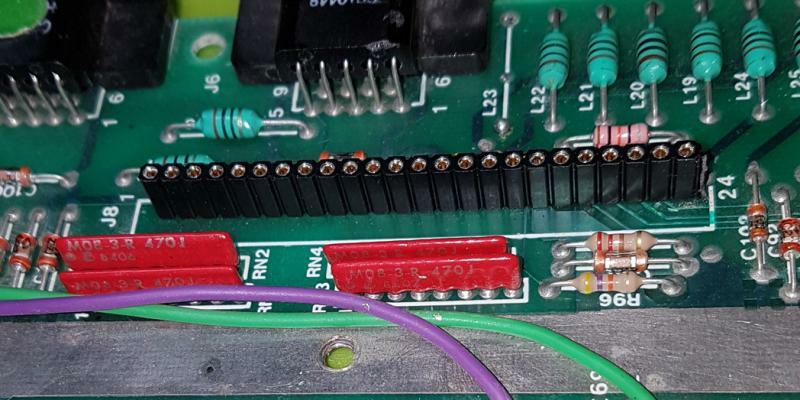 Some time in the past I also use ribbon cables and solder the cables directly to the pads on the mainboard, removing the keyboard connector before. 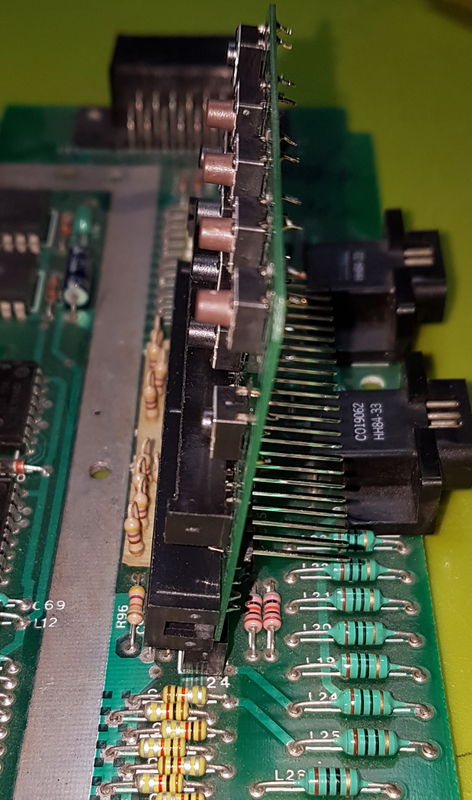 Or, another solution is to use some single row pin heades, they can plugged into the genuine keyboard connector also, but must be fixed. 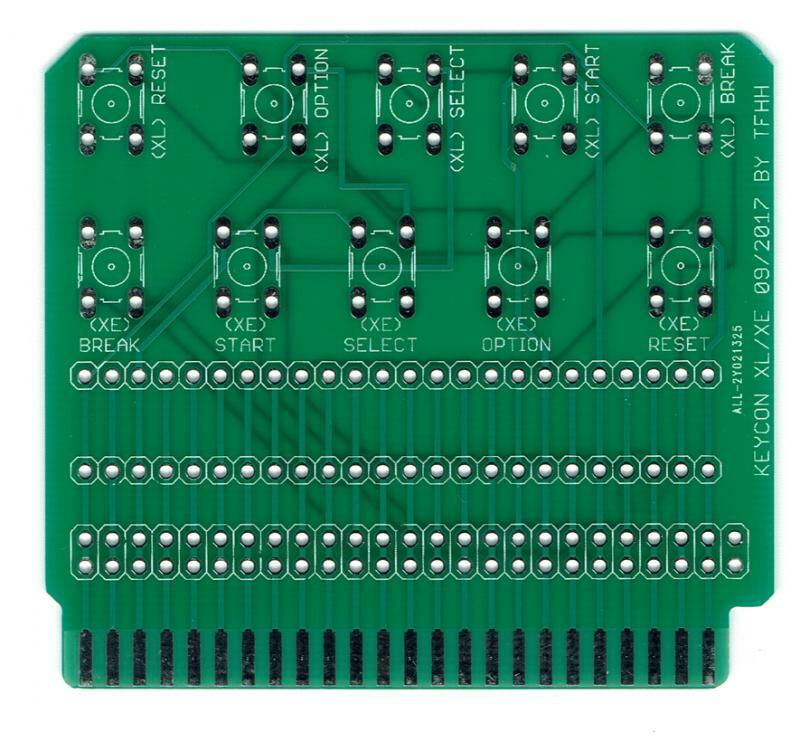 KEYCON can be used for a quick test (just plug the whole PCB with the front side into the existing, genuine connector on the XL/XE) or as a continuous replacement for defect keyboard connections. Below this text you will fine some examples of usage. I will only ship, for interested people, the bare PCB. 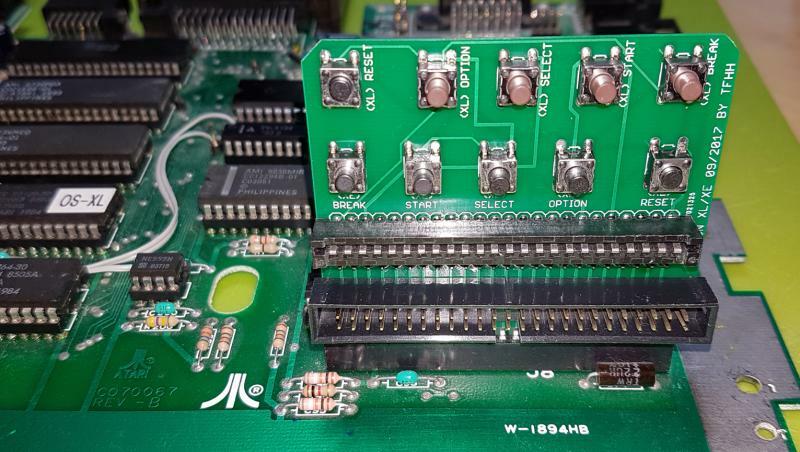 Everybody has different needs and wishes, and all parts (IDC header connector, single row male header and so on) are easy to get in any electronics store. Tipp: sometimes they´re extremly cheap at shops selling accessoires for Arduino & Raspberry Pi solutions. The final version will have ENIG (immersion gold finish) contacts, will be a little smaller than now (actual: 61x69 mm) and will fit better using an Atari 800XL. I have made a little wrong measurement, final version will fit perfectly. Price for one bare PCB will be from 6 up to 9 Euros, depending on the amount of orders. Please show your interest (with quantity you want) here in this thread or by PN. I will collect responses until October, the 4th (2017-10-04) and then sent infos of final price and order details. Shipping for up to 5 pieces worldwide is 5 Euros. Genuine keyboard connector replaced by a female row precision header. KEYCON plugged into the replacement header. The five "XL" keys are in the same order (except BREAK) like on any standard XL keyboard. 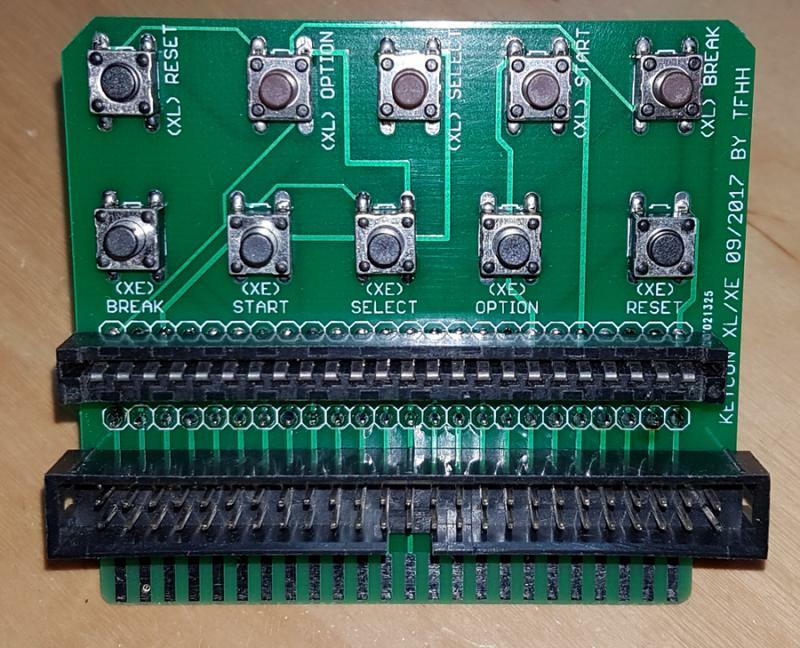 With this prototype layout, the PCB can´t be fit into a cased 800 XL. Of course final version will do. This pictures shows ALL pads on the KEYCON PCB used. This is not mandatory of course. 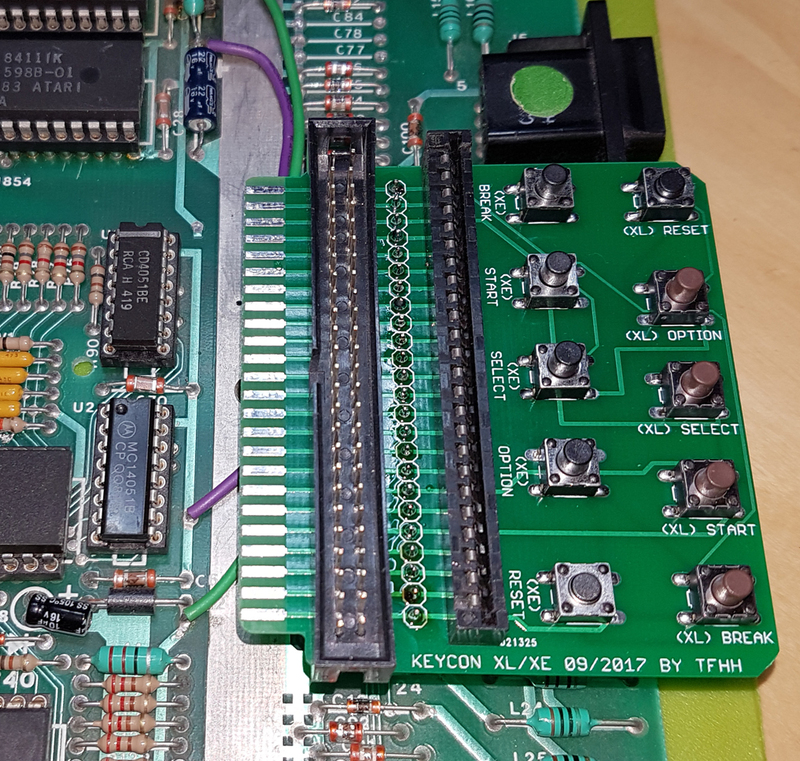 For example, if you install KEYCON permanently, the desoldered genuine keyboard connector isn´t useful placed at KEYCON. 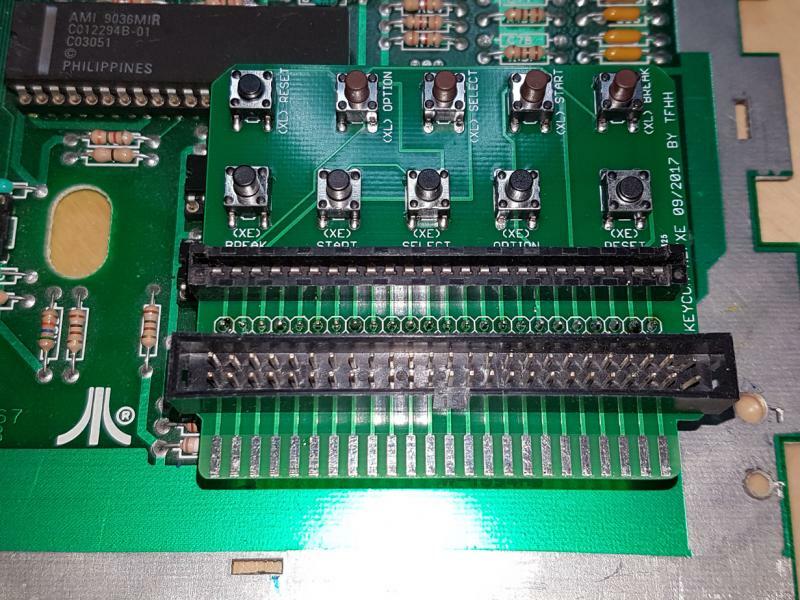 If you want to use a standard 50 pin ribbon cable as the new keyboard cable, then the IDC male header is needed, otherwise leave these pads empty. It´s on you how you want to use it. Also the tactile momentary switches for the keys named above must not installed, if not really needed. You can break this part of the KEYCON PCB away, if you want. There´s no electronics and special thing on KEYCON. KEYCON plugged into the replacement header. The five "XE" keys are in the same order (except BREAK) like on any standard XE keyboard. In post o. 2 of this thread I will collect all interests and amounts. this 2nd post will be used to list all interests and amounts and will be regulary updated by me. Interest poll phase has ended. All interests got a PN with order and payment details. Dude, that is f-ing brilliant !!! You do NOT want to know how often I have been inserting that fragile flexible edge into open machines the last weeks....and then carefully ballancing the keyboard supported by something and praying it would not crash onto something and ripping the flex....and then trying to press some of the function keys....hah, it was more like a circus-act ! Definitely need one please ! When they're done, kindly step into your DeLorean and deliver it to me about 3 months.ago......thank you ! Edited by Level42, Mon Sep 25, 2017 12:20 PM. Very much needed for testing and repairing as I have several XLs without working keyboards. Jurgen I'll take two please. PS will they be ready on the 28th of October? Edited by Mathy, Mon Sep 25, 2017 4:55 PM. I will have them ready for ABBUC general annual meeting, yes. I would also like to have one KEYCON. Ich würde zwei Stück nehmen. I would like one, too! Edited by ivop, Wed Sep 27, 2017 8:55 AM. Ich nehme auch 2 ! Please add me to the list for one unit. Thank you! please 5 pieces for me. So, I assume that because of the thin PCB size it is still possible to insert the original keyboard mylar after using KEYCON for those systems that are still original ? Please add me to the list for two (2) boards. Thank you! LOL, almost missed the deadline. You´re right... when I draw the PCB I don´t mention that these momentary push buttons have two independend ways. Thanks for that idea, it will make the final version much smaller!